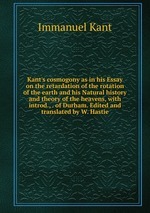 Аннотация к книге "Kant`s cosmogony as in his Essay on the retardation of the rotation of the earth and his Natural history and theory of the heavens, with introd., . of Durham. Edited and translated by W. Hastie"